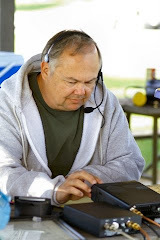 One of my main interests for many years now is Amateur Radio or "Ham Radio". I'm interested in portable operations and emergency communications and enjoy helping people new to the hobby. Professionally I've always been involved in electronics and software development so my hobby and professional interests frequently cross paths. There's nothing better than having someone pay you to do what you love! Recently I purchased a Funk Amateur FA-VA4 kit. I wanted something a little more capable than my MFJ-259B without spending many hundreds of dollars. I'm sure there are much better analyzers but for $120US the FA-VA4 gives me the impedance measurements, SWR sweeps, etc. that I wanted without breaking the bank. Although this is technically a "kit" most of the board comes pre-built. You only have to add some display connections, a switch, the BNC jack, and the battery holders. It's an easy build and worked right away. FA includes a set of connectors to use when self-calibrating the analyzer. They refer to this as a SOL procedure-- S)hort, O)pen, and L)oad. It takes a few minutes but the only thing required of the operator is to switch connections when prompted. All-in-all this seems to be a nice addition to my test bench. On December 16, 2017 Woody WD9F and I journeyed to Taum Sauk Mountain and Knob Lick Mountain in Missouri for a little SOTA activity. 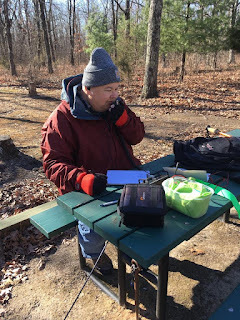 I was operating my Elecraft KX-2 and an end fed wire with a 9:1 unun. Power was an external Bioenno Power LiFePO4 battery. It was a great day with plenty of sunshine, light winds and temperatures in the mid-50's. Had a great time with plenty of contacts. Many thanks to all the chasers!